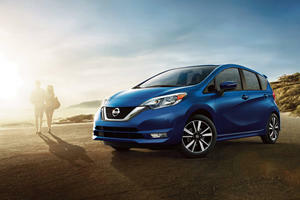 Powered by a 109hp 1.6-liter engine, the front-wheel drive CVT equipped Nissan Versa Note trails other subcompact hatchbacks when it comes to performance and it offers uninspiring driving dynamics. Fuel economy is competitive though and the Note performs well enough in city driving duties. Interior space is good but quality levels are below par, the basic specification levels are dire on base models but move up a few trim levels and you get a rearview camera, cruise control and improved seat coverings. 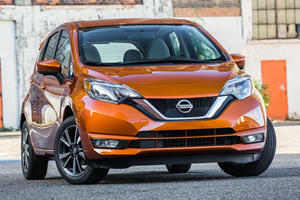 The Nissan Versa Note is a subcompact four-door hatchback that was once a viable budget alternative but which has fallen behind some key competitors when it comes to refinement and performance. Its generous interior space and subtle styling update for 2017 may tempt some shoppers to add it to their shortlist once again. Base Versa’s offer a very spartan interior and the general quality of the materials used on the dashboard and door trims do not match up to other hatchbacks in this segment. Moving to the top trim level does improve matters somewhat but there is no getting away from the budget roots of the outdated and ergonomically fussy interior design. Visibility is good however and with plenty of space for both the front and rear occupants, from the inside, the Versa Note feels a shade larger than its compact dimensions suggest. The cargo area is average but flat-folding rear seats and a number of storage solutions for smaller items make it a versatile load-lugger. Subcompact hatchbacks have become rather entertaining to drive in recent years sadly the Versa Note never got the memo as it were. The uninspiring handling, choppy ride over pavement undulations and lackluster engine/transmission combination are all reminiscent of the way things used to be in this segment. Things do not get much better on the highway where the moaning engine note is joined by road and wind noise. For 2017 all trim models are offered with a 1.6-liter 4-cylinder engine which produces 109 horsepower and 107 lb-ft of torque. A CVT automatic transmission is now standard across the range and power is sent to the front wheels. Performance levels are mediocre the Versa Note feels out of its depth in just about any situation requiring a turn of speed. It does make for a competent city car where its lack of power and droning CVT gearbox are less of an issue. Fuel economy is commendable though with a claimed 31mpg for city and 39mpg for highway driving. It is worth bearing in mind though that competitors either offer more powerful turbocharged engines or more advanced transmission options. 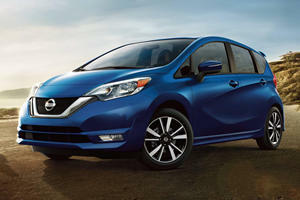 The Nissan Versa Note is offered in four basic trim levels. The base S Plus is very basic despite the promising ‘Plus’ in its title and the only notable features are air-conditioning, split-folding rear seats and Bluetooth compatibility for the 4-speaker radio. Individual options include ambient lighting, Nissan 4G Wi-Fi connectivity and an auto-dimming rearview mirror with HomeLink. SV trim adds cruise control, power windows, 5-inch touchscreen with USB input and rearview camera, remote key entry and upgraded interior coverings. A Sport Value Pack adds 15-inch wheels and a rear roof spoiler while the SV Appearance package offers fog lights, variable speed windshield wipers and the 15-inch alloys. SR trim offers 16-inch alloys, rear roof spoiler, fog lights, outside mirrors with LED turn signals, center armrest and synthetic suede interior. The SR Tech Package adds a 5.8-inch touchscreen with navigation and SiriusXM traffic functionality. Base models offer a strong value proposition but come sparsely equipped, moving higher up the range adds some essential luxury items but also pushes the Versa Note into territory occupied by far more accomplished competitors. 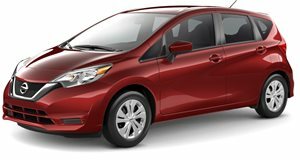 So, despite its new exterior clothing and subtle trim changes, the Nissan Versa Note remains an unconvincing alternative unless generous interior space and potentially good fuel economy are overriding priorities. Is Nissan About To Kill Its Most Affordable Hatchback? Looks like we could be saying goodbye to another subcompact soon. What else has changed 2018?